If you think that people who aren’t fit, fast and fearless deserve the option of getting around their neighbourhood under their own steam on two wheels, without being constantly afraid of being killed… don’t wait to pay attention until there’s a cycleway proposal in your suburb. Have your say on the “Newtown Connections” – there are many good reasons why that’ll benefit you, whether you live in Kāpiti or Kilbirnie. Island Bay is important because Wellington’s had New Zealand’s first, and highest-profile experience with an attempt to build on-road, protected, “all ages and abilities” cycling infrastructure. This kind of infrastructure is something that every town’s authorities know, deep in their hearts, they need to do, but that it’ll be hard. As the largest, richest council in the region, smaller cities and towns watch Wellington closely. But isn’t the Whole Island Bay Thing A Debacle? We keep hearing more about how it’s still causing friction and even on this latest round of suggestions “they’re doing it wrong”. Surely that’s still true? Has anyone noticed they’re now pretty good at it? While the Wellington Public has been regularly ingesting a consistent mainstream media message that Island Bay and all southern suburbs are an ongoing disaster rivalled only by #bustastrophe, other councils around the region have been quietly listening and learning. In practitioner forums, behind closed doors, other councils have continued to watch and listen to the honest behind-the-scenes stories of Wellington city’s experience with Island Bay, and have also been watching and hearing how the council has improved its practices over the ensuing four years. Wellington city’s cycling project engagements are now among the best in the country. Perhaps we learned the hard way – but the Newtown Connections are the first real sign of an important shift: a Wellington city transport project has asked questions of its communities that are moderately holistic, and has changed how it uses engagement feedback in design. Instead of asking people design level questions about what they want on the roads or on the footpaths (“do you want a cycle lane or carparks?“) people were asked what they care about, and about how they wish to get around their suburbs, how they wish to enjoy their public space. 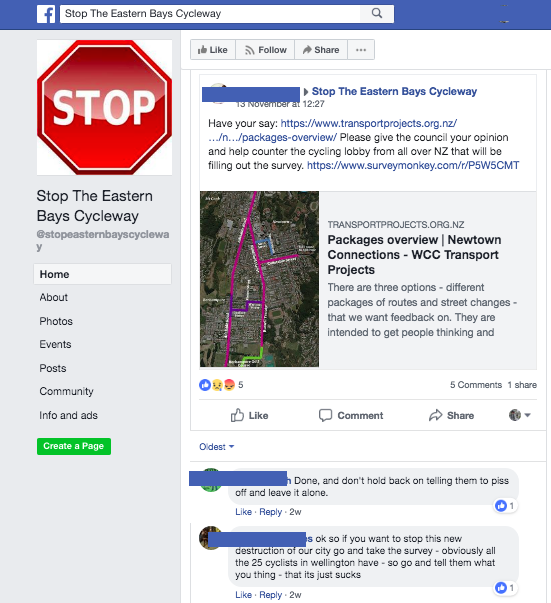 And it’s not lost on anyone how the various local communities’ input on the Island Bay cycleway and associated engagements has become significantly more diverse and more constructive. The locals have noticed – and perhaps it’s mostly commentators with reckons who need to catch up. So, rightly or wrongly many people around the region are paying extra close attention to Island Bay. Some are continuing to use it as a bogeyman; others are using it to get more airtime for their selfish reckons; still others are using it as a barometer for how the conversations will go in their communities when or if they decide to give more road space to people cycling. So, the Southern Suburbs’ “Newtown Connections” matters. It’s definitely worth thinking about, and having a say on. There’s one more week to give your more informed view of the best way forward. …it’s time to double down on the good pro-people momentum here in the Head of the Fish. 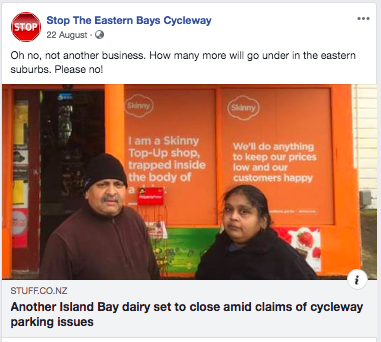 Our guest poster wrote an excellent (hilariously GIF’d) roundup here, and Island Bay Cycleway has careful, open-minded and thoughtful consideration of the options. Make sure you do it by 11th December. this ibra is a small but vocal bunch of selfish nimbys. The most important thing to them is a selfish sense of entitlement that things must never change, that they in their single occupant vehicle get absolute priority over everybody else. Ahhh – Let’s put right the wrongs I. island Bay first – before this council stuffs up yet another – community. Also sorry I missed the name of the person who wrote this piece ? What do you mean right the wrongs / stuffs up another comunity?